Happy to have this 2nd machine which is very easy to use. You do have to make sure you close the capsule holder properly before putting it into the machine otherwise the pod is not pierced properly. The closure can be a bit stiff to push down fully. Overall though a great wee machine. Bought this to replace our old Melody 2 and aint looking back at all its BRILLIANT !! Bought this to replace an old friend ,that was used every day for 7yrs, didn’t know which one to pick ,chose this one couldn’t have made a better choice , ideal for one with small kitchen ,so easy to use . And of course usual great coffee. 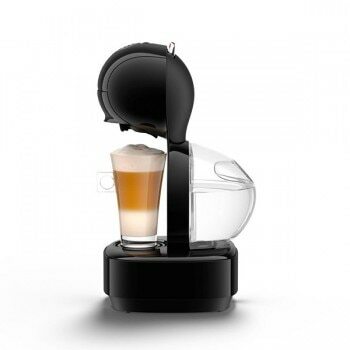 This is my 4th dolce gusto machine but the 1st automatic one. I love how it looks and the fact that it switches itself off. However as in previous reviews the piercing mechanism appears faulty and splits the pods, on occasion, rather than piercing them. I bought the machine in April 2018 and am now on my 3rd capsule holder. On reporting it the 1st time, after a few months use, I received a courtesy box of coffees and a new capsule holder. After another few months the same problem occurred. I rang and reported the problem again but this time was asked to return the split pods, of which I had disposed of, and the packaging! Before the new 2nd new capsule holder arrived I had 2 split pods from 2 different boxes of which I am going to return in it’s packaging. I did get a courtesy box of coffees and a new capsule holder but I felt that I wasn’t being believed and was just after free coffee pods! The new capsule holder doesn’t close properly until you get it in the machine. Very disappointing. Received as a Christmas gift and very pleased with it. Great selection of drinks. We're sorry to hear this Joanne. We've emailed you directly in the hope that we can rectify this. Purchased this machine to replace an earlier model of 10 years. The capsules are loaded in a holder which when closed pierces the capsule. The holder is then loaded into the machine and switched on. On numerous occasions we have found the capsule has not pierced satisfactory and the contents go everywhere other than in the cup. This is both expensive and messy. Judging from reviews of users with similar machines this appears to be a recurrent issue. Would not recommend under any circumstances and will be looking to change. If you can give us a call on our careline number 0800 707 6066 and have your machine and the box of capsules you are having the problems with we can help you further with this problem. I have also sent you an email.